Since I mentioned my love for toners last week, I wanted to talk about the 7 Skin Method which is a major reason that toner is an integral step in my skincare routine. 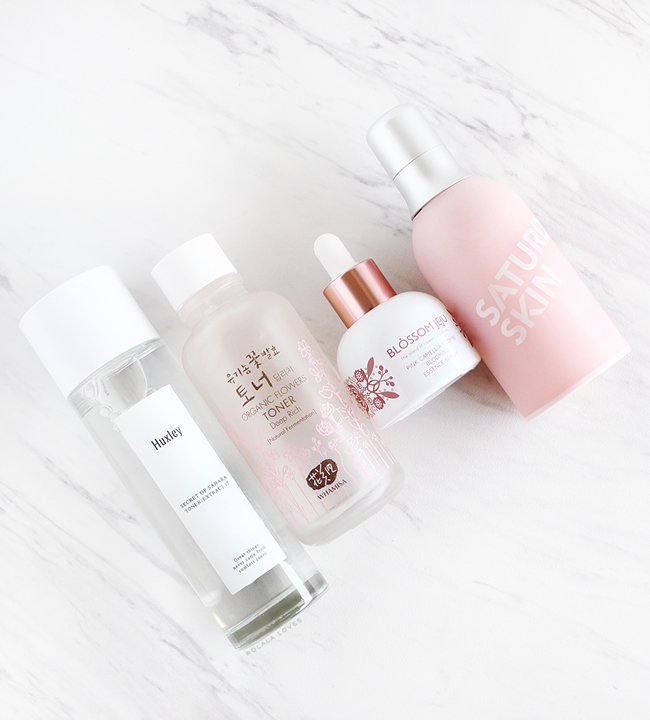 A K-Beauty trend, the 7 Skin Method is a process in which a toner or lightweight essence is successively applied to the face for up to seven times immediately after cleansing and before moisturizing. It is called "7 Skin" because he word for toner and "skin" are the same in Korea. So it is effectively the 7 Toner Method. The concept behind the process is to effectively increase the moisture level of skin without any of the added heaviness or stickiness that can occur with some types of moisturizers. And yes this method can be used in place of a multi-step skincare routine. The 7 Skin Method is an ideal way to hydrate all skin types since layering your toner helps the skin to better absorb the ingredients leading to a better balance between moisture levels and the skin’s natural oils whereby the overall condition of the skin can be improved. The process of the 7 Skin Method is as straightforward as it sounds. After washing your face, while your face is still slightly damp, pour a small amount of toner onto a cotton pad and sweep it gently upwards and outwards on your face and neck. Pour the same toner into the palm of your hands and pat it onto the skin. You don't have to wait in between layers since the patting action helps the product absorb into your skin. This step is repeated five more times but really you can choose to continue this as many times as works for you or as time allows. You can start with a few layers and build up to seven. The key to the 7 Skin Method is choosing the right type of toner. You shouldn't be using an astringent alcohol based toner anyway and especially not in this case since it could potentially irritate and strip the moisture out of your skin instead of replenishing it. I'd also stay way from anything with synthetic fragrances. A hydrating toner or a lightweight watery essence are ideal. You want something with a watery, viscous texture that will infuse the skin with moisture and nourishment. I first implemented the 7 Skin Method into my skincare regimen last winter. My skin is always drier during the colder months and this seemed like a good way to give it a a boost of hydration. I started off with three layers and built to five and eventually seven in the span of a week. I was sold on the method because it virtually eliminated the flakiness and tightness typical to my skin most winters. And over time, my skin has become plumper, more radiant and most importantly less dry overall. Instead of slathering on heavy moisturizers and risking clogged pores, I was letting my toner do the work. It's a practice I have continued and during the summer, it hydrates my skin well enough that sometimes I don't even require a moisturizer. I have a few products that I like to rotate depending on what my skin needs. I do try to use clean beauty products but I don't limit myself to just toners since the 7 Skin Method works just as well with essence products too as long as they're lightweight and watery. Whamisa Organic Flower Deep Rich Essence Toner which is formulated with soothing aloe vera and fermented botanical extracts is one of my absolute favorites. The serum meets toner texture feels incredible and instantly nourishes my skin with moisture and suppleness. Huxley Extract It Toner is a recent addition that I'm really liking for the summer. The alcohol and water-free formula contains organic Sahara prickly pear cactus seed extract and other botanicals that provide hydration and antioxidant nutrition. It feels super lightweight and restorative. My skin just drinks it right in. Bonus points for being super soothing as well. Blossom Jeju Pink Camellia Soombi Essence Serum is a formulation of floral water blended with essential natural oils like camellia oil, chocolate vine & camellia flower extract to moisturize, brighten and firm skin tone and texture. This essence serum has the most divine light jasmine scent. It feels like pure luxury and a little goes a long way to give my skin a lit from within glow. I sometimes mix this one with my base when my skin is looking lackluster. Saturday Skin Freeze Frame Beauty Essence contains an exclusive naturally derived peptide formula that promotes skin's natural regeneration process to increase collagen and elasticity while reducing melanin production. This one has a little more of an emollient feel but without any heaviness. It's great for a moisture as well as a brightness boost. The 7 Skin Method can benefit all skin types. The layers can provide dry skin with an extra dose of moisture. For combination or oily skin types, it is an ideal way to hydrate without any heaviness. The great thing about this method is that it easily adaptable depending on the current condition of your skin and because you don't have to really wait in between layers, it doesn't add that much more time to your routine. It's not written in stone that you need to use 7 layers. I regularly adjust the routine based on how my skin is feeling. Sometimes it just needs 3 layers and some days I need to go all in. And I also mix and match sometimes starting with the most watery to the thickest in texture. There are no rules, just what works for you! What do you think of the 7 Skin Method? Have your tried it? Have you tried any of these products? Th packaging is super pretty! Thanks for the review! Such an interesting post, thanks for sharing Rowena! I never heard of these products before the sound promising to try them out thanks. I am very interested in the method, but I usually use spary toners, I find the cotton pad so wasteful. But I guess if I spary and then pat and repeat it should work as well, no? Thanks for reviewing these products! I can see how the 7 skin care method can be beneficial for your skin! Have a great week Rowena! OK so I've never heard of the 7 skin method, but it sounds pretty wonderful and like it really helped your skin. I have a sk-ii hydrating essence that I think I'll use to try this! Such a great review! Want to try them all, especially the toner! This is fascinating and totally new to me ! Thanks so much for sharing this! I watched Gothamista video on the 7 Skin method and I wasn't sure if it would work. I don't think I have the right toners to do this method but it's definitely interesting to learn that it worked so well for you. You know I am a big fan of toner/skin. I still have astringent type (although the ones I usually go for contain small volume of alcohol only) but always follow up with treatment toner right away. As you said, this has made a big difference! I've been using HABA VC lotion for a long time but when I finish my bottle I wanna switch to something else. I have to say these all look wonderful together. I never use toner b/c I associate it with being drying. But is sounds like todays versions are much more hydrating. This may be something to consider. Hee hee you made me lol tonight, you are on You Tube. 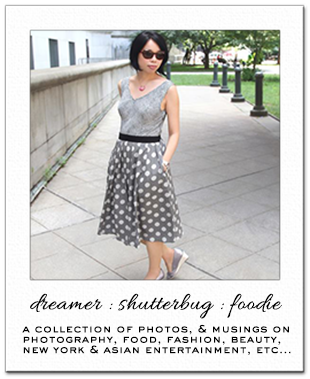 It is up on the blog now. You always feature these awesome skin care lines and I want to try them on. Toner has made a huge different in my complexion so I’m also a fan of toner. My skin gets a lot drier in the winter also, maybe I need to switch it up. You know this 7 skin/toner method sounds very interesting. It makes sense to start applying the toner while the skin is still damp, I think I read somewhere that it helps to keep the moisture in. I also understand why it is very important to pick a toner that doesn't contain any alcohol because that would make the whole thing pointless- as alcohol dries the skin. It seems that the crucial thing about this method is to pick a toner that suits our skin...or to select a few toners that do and that can be used together or separately. The method sounds pretty simple to do, and we can always adjust it to our skin needs...I might give it a try because it sounds like an easy and efficient way to help our skin stay hydrated. It has lovely packaging! I was expecting this to be a 7 step thing but it's good that it's not! That would be a lot of effort haha. Really interesting post! Thanks for the review! Sounds very interesting, Rowena. Never heard of the 7skin method before, tho. I love layering on essences & hydrating toners as well because it gives my combination skin all the hydration without any of the stickiness! Usually I just do it 2-3 times, but I really should try to aim for more! Rowena, this is my first time hearing about this! I have to give it a try because you know I have dry skin. Very simple technique and thanks for the suggestions of toners and essence.